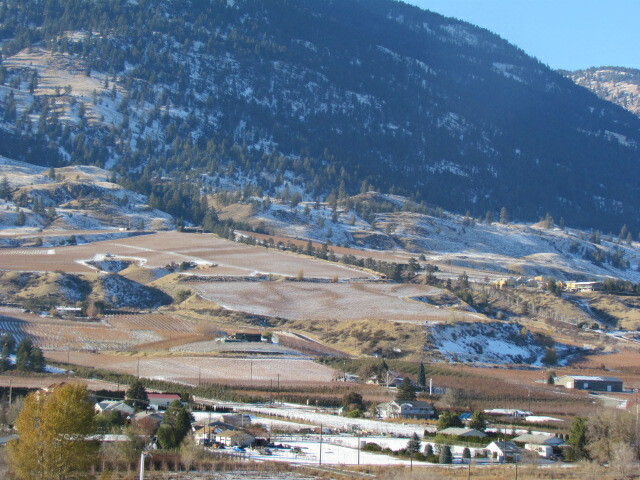 There is a time in the Okanagan Valley where the calendar says it is Fall but we’ve had our first taste of winter. 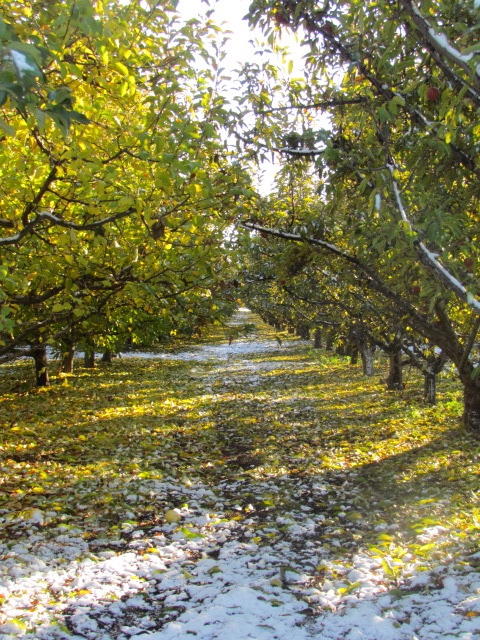 Some leaves remain on the trees but many more join new skiffs of snow on the ground. We are in some kind of stillness between the seasons. 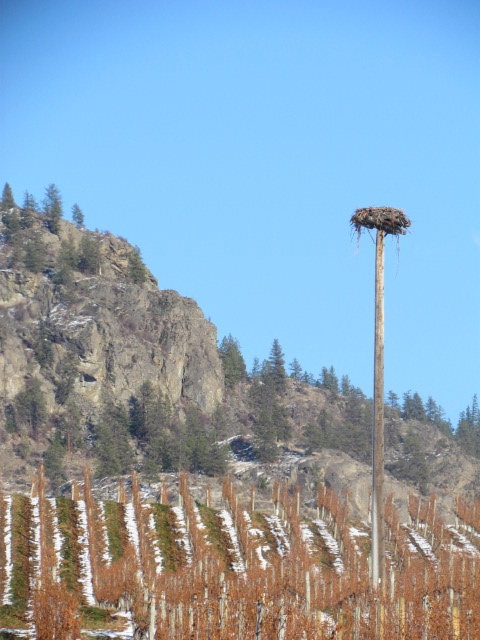 Osprey nest on the eastern Black Sage bench…like an up side down exclamation point on the landscape. Green replaced by browns and whites on the western Golden Mile Bench. 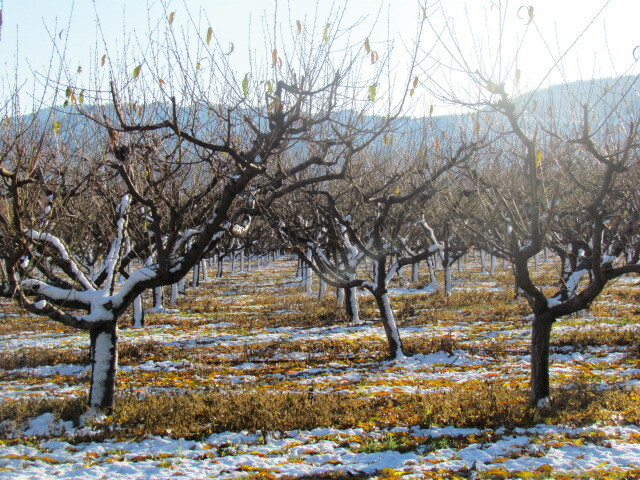 Snow only on the north side of peach trees. Is there any wonder why I love tree pictures so much? 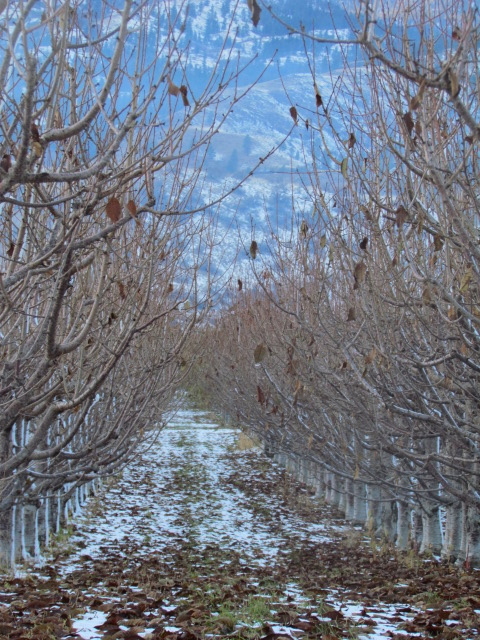 Seems like every year I take a picture down the rows of this orchard near the Black Sage Bench. Contrasting colours and dancing light. 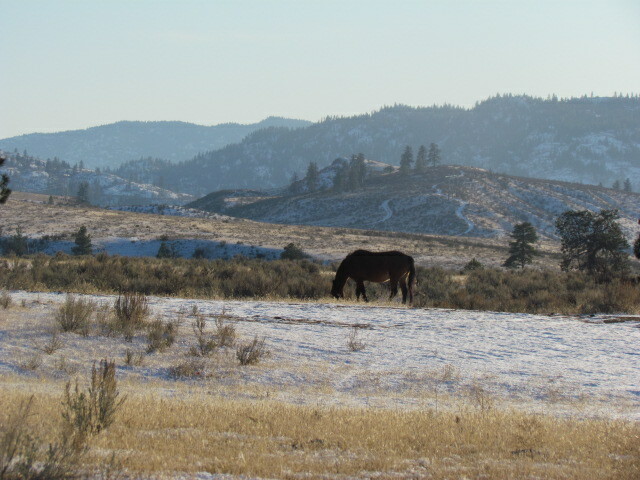 Grays, whites and tans accented by a roaming horse on the upper plateau above Oliver. I almost felt the need to apologize for the intrusion. 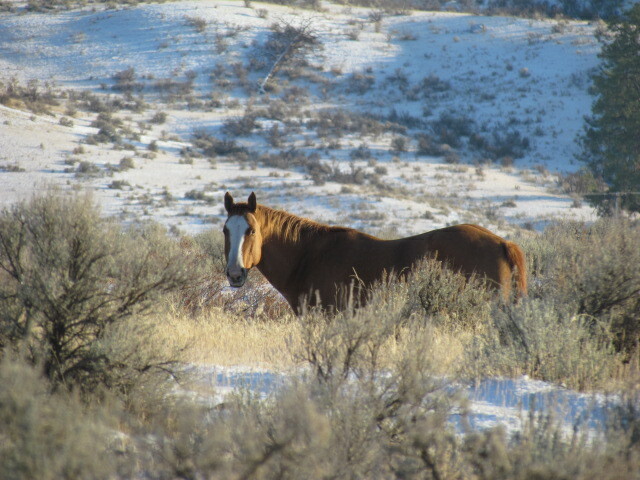 Quiet, crisp and the sweet smell of sage in the air. 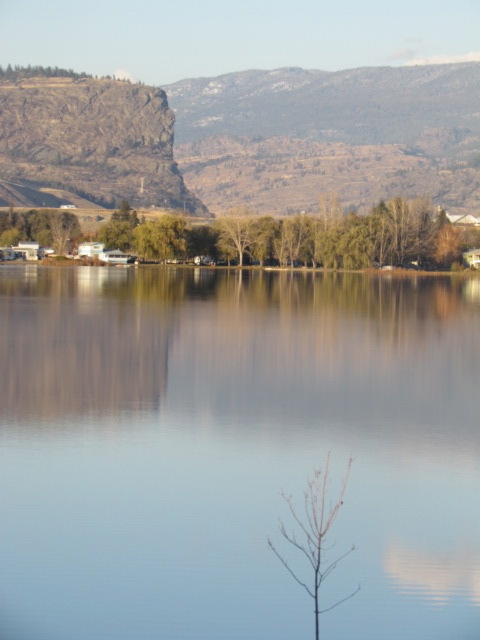 Tuc el Nuit Lake with McIntyre Bluff in the distance. 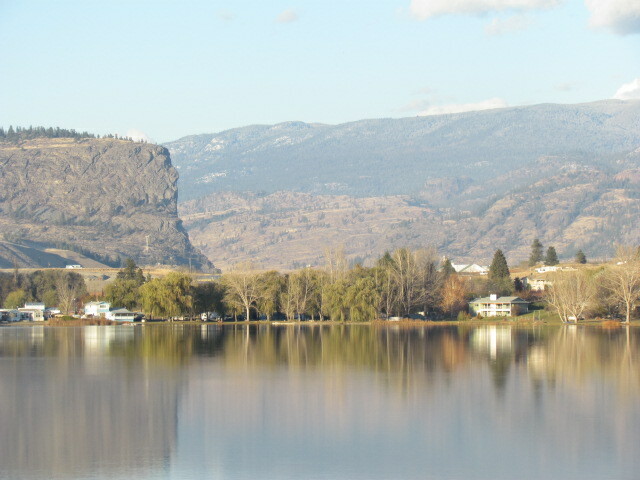 Reflection has the colours of Fall but the stillness says Winter. Landscape or portrait–it’s still beautiful. All harvest this driveway had a “No Help” sign on its bins. 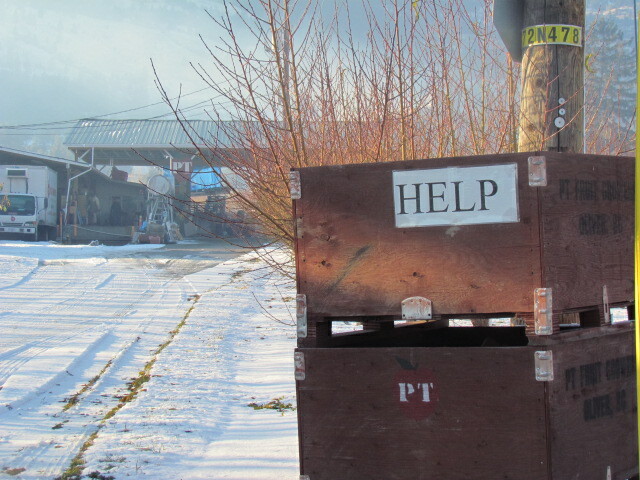 At some point it was changed to “Help”. Now, does that mean they needed pickers or that they were having a challenging harvest? I love the lines that farmers make. 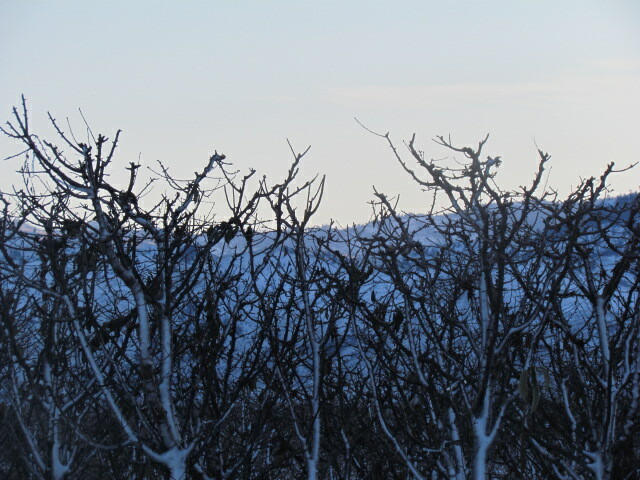 And with the light fading when I took this it made the picture seem even more cold–but it was quite warm. Like soldiers. Accented by the dozen or so leaves that remain. 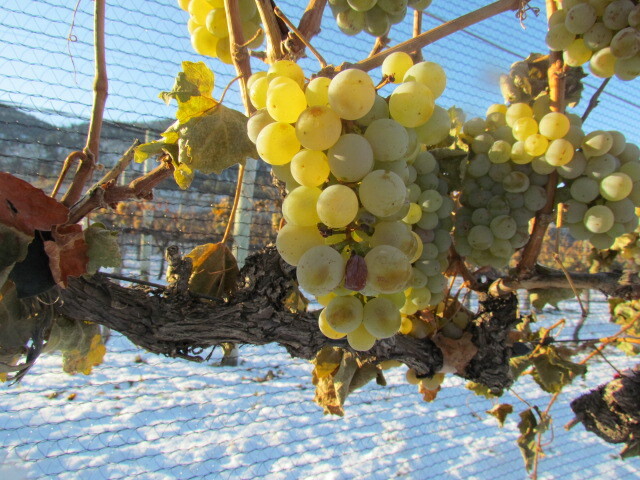 Kerner grapes from Block 1 waiting for the time to be winter, not just nearly winter. Icewine is their destiny. 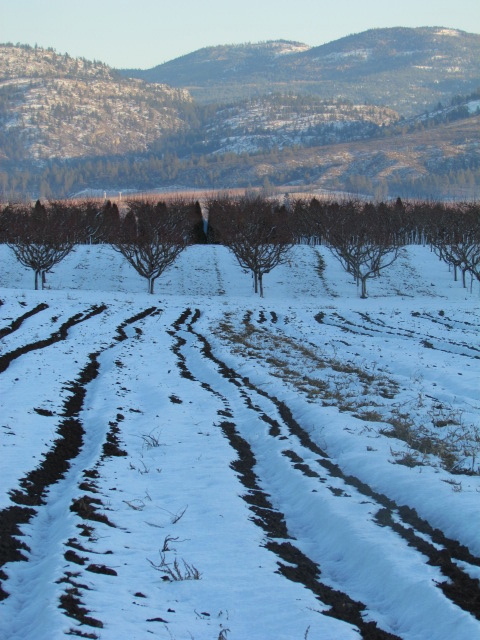 This entry was posted in Grapes and Wine, Local and tagged BC, British Columbia, fall, Grapes, horse, kerner, okanagan, Orchard, snow, south okanagan, vineyard, winter. Bookmark the permalink. Beautiful shots Sandra. You have really captured the essence of the landscape particular to Oliver and the bench. I will need to see it in this season some day. Good time. It’s pretty quiet! Wonderful! I can feel the chill, but also the warmth of the…. Finter sun 😉 of is that Fallter? 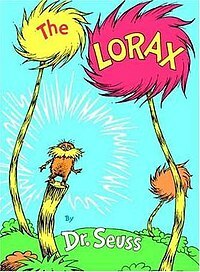 Totally looks like Lorax trees! Lovely collection of images that convey the beauty in the landscape as the seasons shift. Thank you for sharing these pictures. Thanks Sasha. I keep taking more but never sure if I should post or not! Excellent avdcie! I hope your readers take the time to read the whole article by the Doanes and PRINT it out. They are like the “scouts” on a journey to an unfamiliar territory. I am looking forward to the next installment.